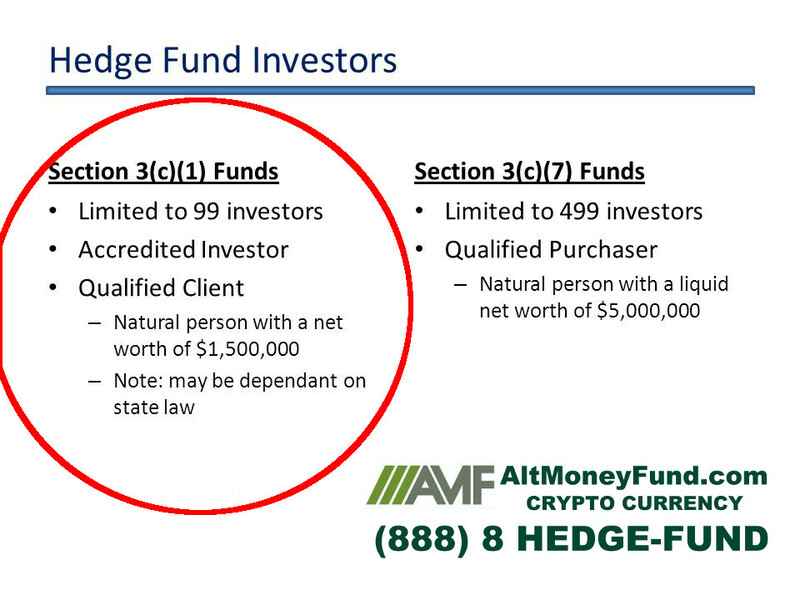 Accredited or Qualified Investors must contact a fund Representative at: info@altmoneyfund.com . After reviewing the Fund's PPM (Private Placement Memorandum, Limited Partnership Agreement, and filling out the Subscription Documents), the investor is ready to come aboard at the next Monthly Break Period. PAGE 4 OF THE SUBSCRIPTION DOCUMENTS CONTAINS INFORMATION ON FUNDING YOUR SUBSCRIPTION in Bitcoin (BTC). IMPORTANT: Send only BTC to this deposit address. Sending any other currency to this address may result in the loss of your deposit. To be an accredited investor, a person must demonstrate an annual income of $200,000, or $300,000 for joint income, for the last two years with expectation of earning the same or higher income. ... Also, if an entity consists of equity owners who are accredited investors, the entity itself is an accredited investor.